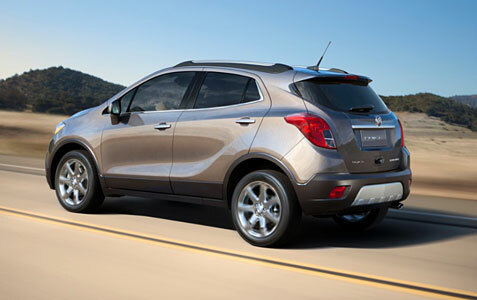 Buick has taken a major step forward by entering the small luxury crossover market with the all-new 2013 Buick Encore. In the U.S., sales of compact crossovers are expected to grow more than 360,000 units by 2015 as buyers’ needs and priorities evolve. While many luxury brands offer similarly sized vehicles in other countries, Buick is one of the first to offer one to U.S. consumers. 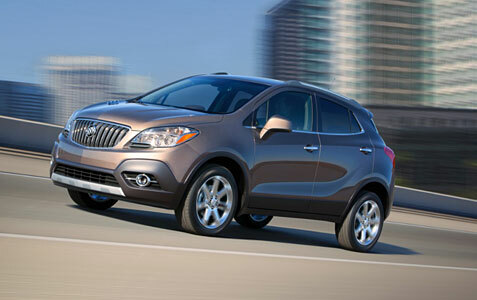 We spent a week driving the 2013 Buick Encore FWD Premium and now understand why this market is on a growth path. The 2013 Buick Encore FWD Premium might be considerably smaller than the traditional Buick vehicle, but there is no mistaking Encore for anything other than a Buick. Encore’s sculpted and elegant styling identifies it as a contemporary Buick. Signature cues include a waterfall grille, chrome accents and surrounds, portholes on the hood and painted lower panels. Standard body-color door handles with chrome strips and a styled, stainless steel exhaust tip add to the premium look. Blue-accented halogen composite projector-beam headlamps and detailed tail lamps further enhance the Encore exterior, and 18-inch, five-spoke painted aluminum wheels are standard. Seven-spoke chromed aluminum wheels were on our test Encore and they really elevated the appearance. Our test model also boasted deep tinted glass, outside heated and power adjustable body color mirrors, chrome door handles and roof rack with side rails. My first reaction after entering the cabin of the 2013 Buick Encore FWD Premium was a bit of surprise at how much space was available for both the front and rear passengers. With room for five and up to 48.4 cubic feet (1,371 liters) of storage space with the rear seat folded, the Encore offers substantial cargo capacity along with its confident, higher driving position. Encore’s distinctive styling carries over to a flowing instrument panel that wraps naturally into the door panels. A prominent central instrument panel houses the seven-inch, high-resolution, full-color display for the standard IntelliLink voice-activated infotainment system. It also features displays for the SiriusXM satellite radio and standard rearview camera, as well as the GPS-enabled navigation system. An all-ebony or contemporary mix of dark and light tones distinguishes the cabin, which is accented with ice-blue ambient lighting, select use of bright chrome and wood grain trim. Premium seats feature high-density foam for greater comfort on long drives. They are trimmed in either a contemporary cloth/leatherette or available premium leather. The 60/40 flat-folding rear seat features a fold-down armrest with cup holders. We were impressed by the comfort seating and upscale feel of the leather seats. Designers filled the Encore with ample storage, including eight beverage holders, storage in all four doors, four bins in the dash, pockets in the seatbacks, an available bin beneath the passenger seat and bins under the rear load floor around the spare tire. It offers 18.8 cubic feet (532 liters) of storage behind the split-folding rear seat and 48.4 cubic feet (1,371 liters) with the rear seat folded. When the rear seat is folded, you’ll create plenty of space for a considerable getaway. Even the front passenger seat folds flat to extend the cargo length and accommodate long items that otherwise would not fit in a vehicle of this size. There is also plenty of space up front for two large adults to own their elbow space. We enjoyed features like the voice-activated Buick IntelliLink with full color display radio that supports audio streaming from Pandora internet radio and Stitcher smart radio; dual-zone climate controls; heated steering wheel; heated leather seats; power passenger’s seat; driver memory presets; Rainsense wipers; and Bose seven-speaker sound system. And, of course, the ultimate assistant with 6 months of OnStar Directions and Connections service with hands free calling, remoteLink mobile app and OnStar family link. OnStar’s RemoteLink Mobile App allows smartphone users to control vehicle functions, access vehicle information and send directions directly to the vehicle. The new opt-in FamilyLink service allows subscribers to stay connected to loved ones by checking the location of their vehicle online or by signing up for vehicle location alerts. Owners pairing the Pandora internet radio app interface with a smartphone can tune to a favorite station by giving a voice command. Likewise, saying “More like this” while an iPod or other USB media device is playing uses Gracenotes media database technology to generate a random music playlist based on the current song. Gracenotes album cover art display capability also includes genre and artist art. SiriusXM Satellite Radio service adds SiriusXM Tune Select, which lets drivers and passengers tag an artist or song name to trigger an on-screen notification when a favorite tune plays on any SiriusXM channel. Another feature, SiriusXM Travel Link, offers nearby fuel prices, movie theater show times and weather reports. All services require a current SiriusXM subscription. We immediately tested the 2013 Buick Encore FWD Premium in both city and highway driving and she clearly passed the test! The Buick Encore is powered by an efficient, power-dense Ecotec 1.4L turbocharged four-cylinder engine and six-speed automatic transmission. It generates an SAE-certified 138 horsepower (102 kW) and 148 lb.-ft. of torque (200 Nm) between 1,850 and 4,900 rpm. The wide rpm range for the maximum torque – a specific trait of turbocharged engines – helps it deliver a better driving experience and performance. With combined EPA-estimated fuel economy of 28 mpg on FWD models (25 city / 33 highway), the Encore delivers the highest fuel economy of any crossover from a domestic automaker. The 1.4L’s turbocharger is integrated within the exhaust manifold for reduced weight and greater packaging flexibility. A reinforced crankshaft and forged connecting rods deliver additional strength to support the engine’s pressurized power and torque over a wide rpm band. Hydra-Matic 6T40 six-speed automatic transmission backs the Ecotec 1.4L turbo engine. It’s part of a family of six-speed front- and all-wheel-drive transaxles developed for small cars and crossovers. It has a unique design, with the planetary gearsets positioned on the same axis as the engine crankshaft centerline, making the entire powertrain unit shorter fore-to-aft. This design enables a shorter overall vehicle length, increased interior space, enhanced safety crush zones and lower weight. The Hydra-Matic 6T40 offers a “steep” first gear and a “tall” overdrive top gear to achieve a wide ratio spread of 6.14:1. This allows the Encore to achieve robust acceleration, as well as fuel efficiency and lower engine noise at highway cruising speeds. This high-tech system performs very well on the road, giving the driver the confidence needed to drive in heavy traffic and open roads. We found that the 2013 Buick Encore FWD Premium crossover delivers Buick’s signature style, interior acoustic refinement and luxury amenities in a maneuverable, versatile and efficient package designed to appeal to a new audience of buyers at a price as tested of $29,735. The introduction of the Encore gives Buick four models with turbocharged four-cylinder engines and six models with EPA-estimated highway fuel economy of 30 mpg or more. The size of the Encore is surely smaller than past Buicks, but there is no shrinkage in style, luxury, performance or quality. For those looking for a new way to enjoy everyday driving or long winding roads, the 2013 Buick Encore FWD Premium Crossover should be on their shopping list.